Discussion in 'Military History' started by Austerlitz, Oct 25, 2016. Panipat has been described as the pivot of indian history for 300 years.And its story begins in the first great battle of 1526.After the fall of the sayyids,the afghan lodi dynasty had seized power at delhi.The power of the sultanate had decreased considerably at this time,though the sultan could still command significant resources.Ibrahim lodi,the third ruler was unpopular with the nobility for his persecution and execution of a large number of old nobles.A prominent noble,Daulat khan fearing for his life appealed to Zahir-ud-din Babur,the Timurid ruler of Kabul to come and depose ibrahim lodi.It was thought that babur would defeat lodi,plunder and leave.Babur however had different ideas. Babur,a timurid prince with descent from Timur and Chingiz khan had originally inherited the kingdom of fergana -one of the brekaway regions in the aftermath of the breakup of the once mighty timurid empire.The 2 foremost powers in the region at this time were the Safavids of Iran and The Uzbeks of central asia.Squeezed between them babur had to fight for survival.Gaining and losing Samarkand 3 times he eventually moved to Kabul in 1504,where he aimed to consolidate a powebase.It was here that he came into touch with India and between 1504 and 1524 had raided accross the Northwestern frontier 4 times.His main goal at this time was to consolidate his position in Afghanisthan by crushing the rebellious pathan tribes of the region,particularly the Yusufzais.Having given up his aspirations of retaking Samarkand in 1512 he now dreamed of a new empire east of the Indus,and bided his time for an oppurtunity.In the Baburnama he writes that as these territories were once conquered by timurlane he felt it was his natural birthright and he resolved to acquire them by force if necessary.The invitation of the Afghan chiefs provided him with this oppurtunity. 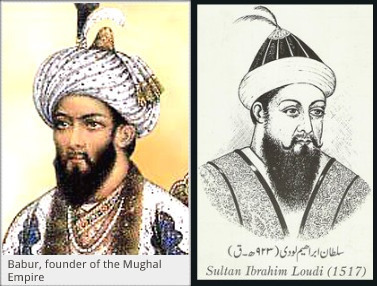 Babur started for Lahore, Punjab, in 1524 but found that Daulat Khan Lodi had been driven out by forces sent by Ibrahim Lodi. When Babur arrived at Lahore, the Lodi army marched out and was routed. Babur burned Lahore for two days, then marched to Dipalpur, placing Alam Khan, another rebel uncle of Lodi's, as governor.There after he returned to Kabul to gather reinforcements.Alam Khan was quickly overthrown and fled to Kabul. In response, Babur supplied Alam Khan with troops who later joined up with Daulat Khan and together with about 30,000 troops, they besieged Ibrahim Lodi at Delhi. He defeated them and drove off Alam's army , Babur realized Lodi would not allow him to occupy Punjab.Meanwhile Alam also demanded Babur assign delhi to him after its capture,which was not acceptable to Babur.In 1525 November ,Babur set out in force to seize the empire he sought.Crossing the Indus a census of the army revealed his core fighting force numbering 12,000.This number would grow as it joined his garrison in Punjab and some local allies or mercenaries to around 20,000 at Panipat.Entering Sialkot unopposed he moved on to Ambala.His intelligence alerted him that Hamid Khan was about to reinforce Lodi's force with a contingent,he sent his son Humayun to defeat his detatchment at Hisar Firoza.From Ambala the army moved south to Shahabad, then east to reach the River Jumna opposite Sarsawa. At the same time Ibrahim Lodi, Sultan of Delhi, had gathered his army and was advancing slowly north from Delhi, eventually camping somewhere close to Panipat. Late in March 1526 Ibrahim decided to send a small force across the Yamuna into the Doab (the area between the Yamuna and the Ganges).Babur learnt of this when he was two days south of Sarsawa, and decided to send a raiding force across the river to attack this detachment.His right wing had won the victory on 26 February, and so this time he detached his left wing, once again reinforced with part of the centre, so the two armies may have been about the same size. 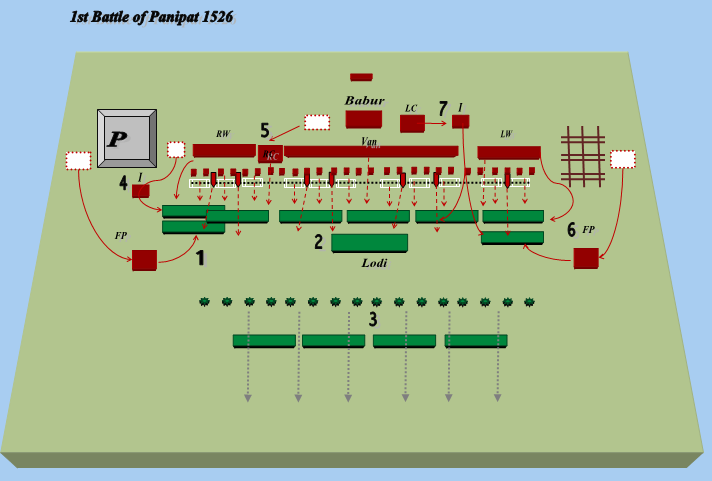 Babur's men crossed the Jumna at midday on 1 April, and advanced south during the afternoon.At day-break on 2 April Babur's men reached the enemy camp. Daud Khan and Hatim Khan would appear to have been caught by surprise and attacked before they could form their men up into a proper line. 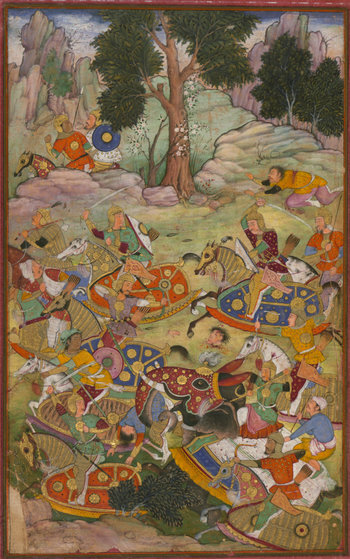 Babur's men quickly broke their resistance, and chased Ibrahim's men until they were opposite Ibrahim's main camp. Hatim Khan was one of 60-70 prisoners captured, along with 6 or 7 elephants. Just as after the battle on 26 February most of the prisoners were executed, again to send a warning to Ibrahim's men. After this victory Babur continued to advance south, reaching Panipat on 12 April.Here Babur recieved news of the apparent huge size of Lodi's army and began to take defensive measures.He was confident in his troops,the core of which were battle hardened veterans ,loyal friends to him through thick and thin.He also enjoyed a solid rapport with his men and treated them on a equal footing.Any could dine at his table.Ibrahim lodi however was facing dissension in ranks.He even had to resort to distributing riches to encourage his troops and promised more.Personally brave,ibrahim was an inexperienced commander and quite vain which upset some of the afghan nobility. For eight days Both armies stood facing each other without making a decisive move.Finally babur in an attempt to goad lodi into attacking him ordered a night raid by 5000 picked horsemen.However the attack faltered badly,and the mughals narrowly escaped. Elated by his success,Lodi now advanced to meet Babur's forces on the fields of Panipat. 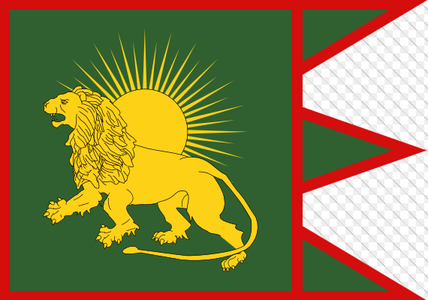 The Delhi sultanate armies had traditionally been based around cavalry.To this the addition was made of the Indian war elephant.The Elephant and horse formed the 2 pillars of sultanate military strength.The army would be based on a quasi-feudal structure.A small central force uder the Sultan's direct control at Delhi supplemented by large number of contingents brought by the different afghan chiefs or Jagirdars,plus Jagirdars(turkish) and indian feudal levies and mercenaries(largely infantry).There was no gunpowder artillery and infantry was very much a cannon-fodder force.Ibrahim Lodi was at this time involved in attempts at centralization which was unpopular amongst his chieftains.Ibrahim Lodi's army at Panipat may be estimated at 50,000 men and 400 war elephants.Perhaps 25,000 of these were heavy cavalry predominantly afghan ,rest being feudal levies or mercenaries of less value. 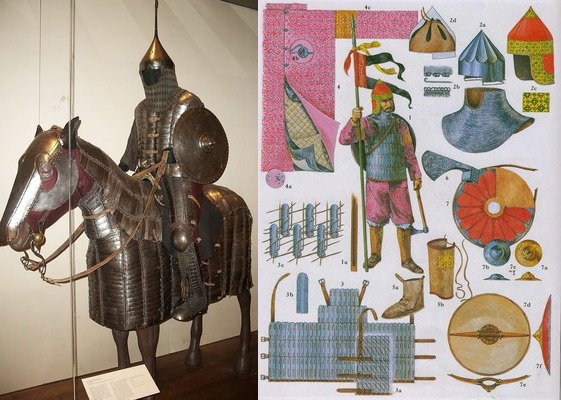 The afghans were not a steppe people and thus didn't master horse archery.Rather they relied on heavy shock cavalry as the basis of their military power.Above shows the equipment of an afghan mailed heavy lancer.To the left is one wearing the standard plate-chainmail hybrid armour of the day.To the right is iron lamellar armour.Both would have been in use ,though mail would have predominated.2 in the second picture depicts a typical afghan mailed lancer in action.They were a redoubtable foe and under Sher shah proved could easily turn the tables on the mughals. Ghulam Armoured cavalry,standard melee cavalry of the delhi sultanate since the time of the ghurids.These would have changed little since the early days of the sultanate except perhaps in armour.Even though the turks were no longer in power at delhi,most jagirdars would be bringing cavalry of similar type.Armed with Shield,lance,Mace and scimitar. Ibrahim's Primary shock force was his 400+ armoured elephants. A terrifying shock weapon as well as mobile fortress,used properly they were a formidable problem.They mounted a mahout and 2-3 infantrymen with spears and bows.Against the earlier mongol invasions of the delhi sultanate under the khiljis,the combination of armoured elephants and Sultanate cavalry had proved too much even for the mongols.However this descendant of genghis had something-that the earlier chagatai mongols didn't have - Cannons. Techy, Levina and Inactive like this. India's humid climate,the impact of archery and the dominating presence of war elephants didn't allow the development of heavily armoured infantry or pikemen in packed formations as in europe.Infantry were very much cannon fodder.Lodi's army would have consisted of several types of infantry,infantry itself being held in low regard during his period. 1.The afghan chiefs would have brought with them along with their mounted retainers, Pashtun tribal foot infantrymen armed with an assortment of weapons including axes,swords and spears.May or may not be armoured according to wealth. 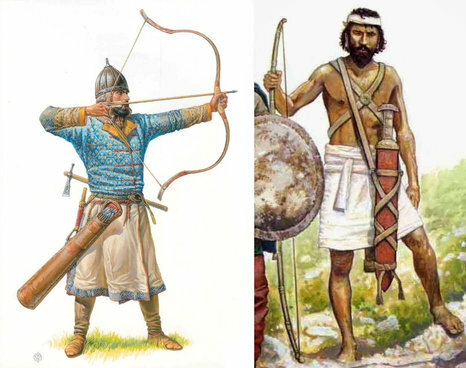 3.Bumi feudal levies conscripted by the local zamindars/chieftains making up the numbers.Generally no armour,a traditional bamboo longbow(inferior than the composite bow but more durable and easier to obtain) and a broadsword.Mercenaries might have armour. The battle formation consisted of the traditional five-fold divisions - the vanguard, the right, the left,the centre and the rear.Sultan stood at the centre with a picked body of cavalry.Skirmishing and night raids were common.The Afghans based their battle tactics around the shock strike forces of their elephants and heavy cavalry. Brute force in massed frontal assaults on the flat plains were therefore key elements of Ibrahim lodi's plan.A considerable part of this army was feudal contingents from the various nobles,they were thus not drilled nor trained to work in co-operation with the whole body,and suffered from lack of manuevreability.They were however well equipped and courageous,if lacking the discipline of the veteran baburids.They also had no understanding of the Tulughma tactics of Central Asia. Babur's army consisted of turks,mongols,iranians and afghans.It was built as a veteran core which had been campaigning alongside him for over a decade and thus the troops and commanders were confident,and familiar with each other.It also had an element of equality where any trooper could dine with babur or give his opinion on tactics in contrast with the tiered hierarchy in the sultanate army.And they were campaigning far away from home,where defeat would mean annihilation with nowhere to retreat.All these factors contributed to better morale.The army was organized along timurid lines -units of 10,50,100,500,1000.Babur's army at Panipat numbered 15,000-20,000 men. The bulk of them timurid cavalry,supplemented by turkish gunners with gunpowder matchlocks and cannons-till now an unknown feature on the indian battlefield. 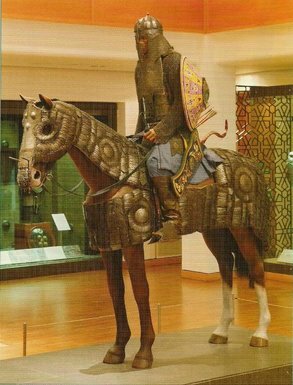 Cavalry was the centrepiece of the mughul army.Babur's horsemen would have been composed of Horse archers - mainly mongols recruited from moghulistan in central asia and masters of steppe warfare and also turks and heavy melee cavalry(who may also use bows).Even the horseachers in the mughul army wore full armor.Lamellar armour was in extensive use alongside chainmail-plate hybrid armours. 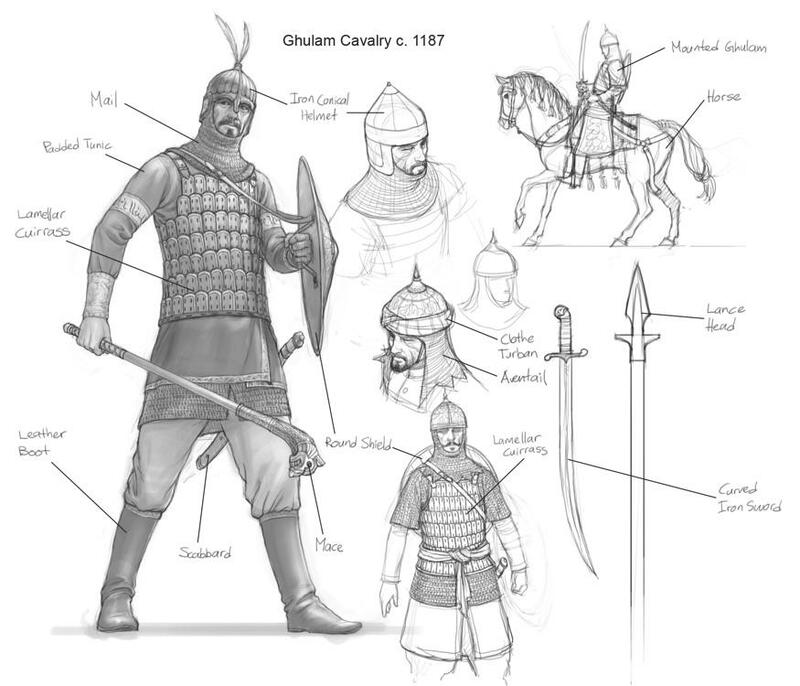 (so called 'mirror' armor).First picture on top shows baburid shock cavalry using lances ,swords.They usually wear mailshirts beneath a padded jacket on top.On the right is a light horseman with scimitar.Second picture above shows a cavalryman in lamellar armour and lance on the left,he is fully capable of acting as a horse archer.On the right is pure heavy cavalryman in mail armour(mail more suited to close combat)with straight sword and batle-axe. Mughul Horse Archer in full armour and composite bow to his side. 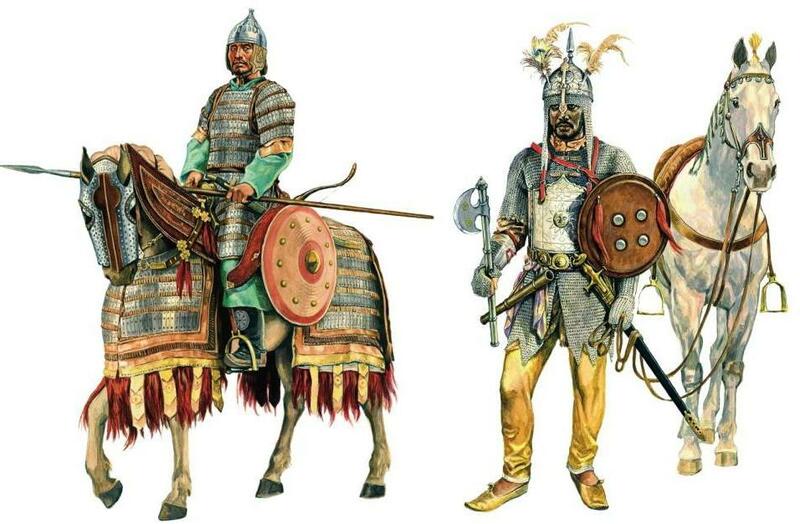 A product of steppe warfare,horse archers were the primary cause of the superiority of nomadic armies in the age of cavalry and among the most effective troop types in military history.Though the afghans had excellent horsemen as well,they relied on heavy mailed cavalry over mounted archers.They were masters of ambushes,raiding,feigned retreats.The deadliest mughul weapon was the Turco-Mongol Composite bow.Generally capable of shooting 3 times faster than a matchlock it was in the handsof a veteran horse archers possible to launch volleys of 6 shots in 20 seconds.It was accurate upto 70-100 yards and still dangerous upto 200 yards.Babur employed his horse archers to the flanks and in front of his army as a screen. 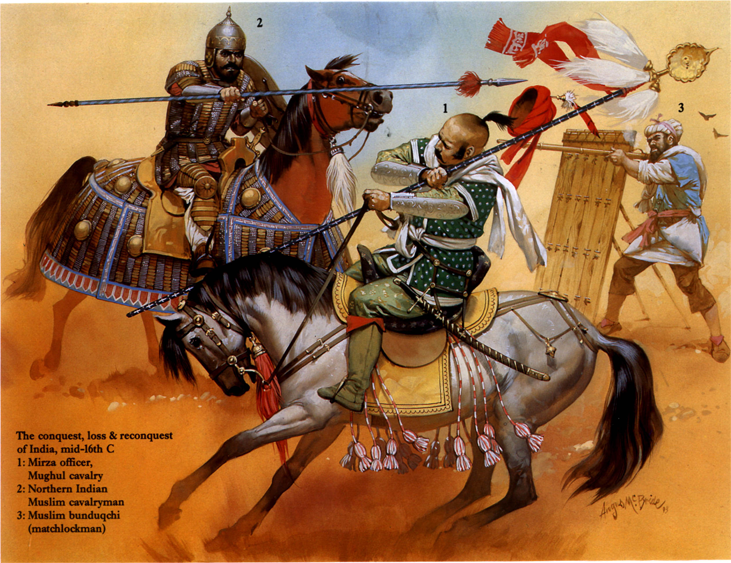 At the back -Timurid Horse archer on his mount.Standing in front is a Turkish 'Turkhaan' or hero-an elite Mounted trooper in full body armour and faceplate -usually a member of the commander's bodyguard or a captain of a unit.In front is an elite infantryman of the guard (Shamshirbaaz) with sword,shield and bow.Babur's cavalry was battle-hardened and well-drilled. Babur's infantry was of 2 main types.Footarchers armed with composite bows and a secondary weapon and more importantly Matchlock musketeers.Ratio of archers to matchlockmen was 4:1.Both weapons had about the same effective range of 100 yds.But bowmen had almost 3 times the rate of fire while matchlocks had unparalleled armour penetration and lethality,capable of stopping a horse or even an elephant dead in its tracks.Matchlock musketeers were called Tufang or Bunduqchi and used a protective mantlet as cover when firing the weapon.Matchlockmen in babur's service were mostly turkish origin. Gunpowder weapons were introduced in central asia by the Mongols who brought them from china,but these were very rudimentary mainly siege devices.The ottomans developed gunpowder weapons quite early along with the europeans.In the first decades of the 16th century the newly equipped ottoman gunpowder armies inflicted stunning defeats on their safavid rivals who in a crash programme equipped themselves with similar weapons.Babur who was in intimate contact with safavid military developments at this time possibly acquired these weapons in the same manner. Babur began a new epoch in indian military history with the introduction of field artillery which he would use to devastating impact.Four the basic models were used by Babur—the zarb-zan, (light cannon), kazan, (heavy cannon), kazan-i-bozorg (siege gun) and firingi (swivel/anti-personnel gun) with only the first 2 types present at Panipat.Babur’s artillery used only stone shot.Stone was cheap and plentiful, but the production of stone cannon balls was extremely labor intensive. Metal was more expensive, but metal shot was much easier to make. Stone projectiles were not as dense as metal and transferred less energy to the target, but they might also shatter on impact, producing lethal shrapnel as a secondary effect. Metal ammunition did have one very important advantage—it could be made hollow. When left empty such projectiles were lighter and could travel further. When loaded with gunpowder, they could be fused to explode on impact.They were not horse drawn but rather mounted on carriages.Babur had 20 cannons at Panipat. 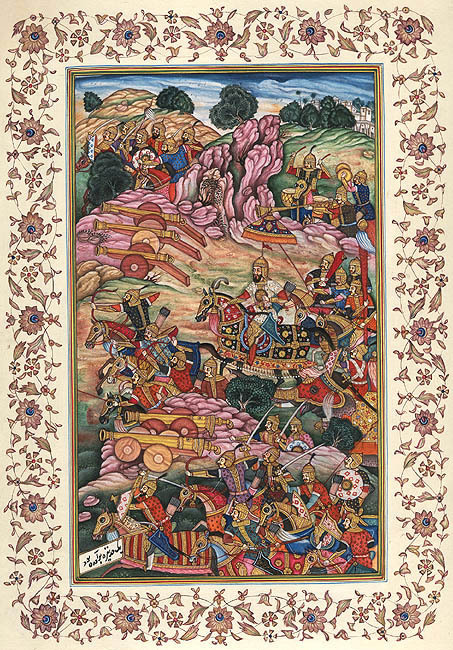 Babur's tactics at Panipat showed the influence of a mix of 2 military traditions - The Ottoman and the Mongol-timurid.The use of wagon carts as battlefield defenses was first pioneered by the Hussite rebels of Europe under Jan Zizka,though the Hungarians it was transmitted to the Ottomans who made it the centrepiece of their tactical system - The Tabur Cengi( camp battle).Even previously the ottomans employed infantry in the centre behind natural defenses to act as a pivot flanked by mobile cavalry wings,an advance guard and a reserve to the rear as demonstrated at Nicopolis.The adoption of the cart-wagon line allowed them to create artificial defenses for their infantry now.These tactics were used to devastating effect vs the safavids in 1514 and against the hungarians at Mohacs in 1526.It was through his turkish gunners that Babur came to be acquainted with this system of battle. Below- On top the Ottoman Tabur cengi.Boxes with Diagonal shades -Cavalry.Cross shades -Infantry.Light colour indicates light cavalry or infantry.Akinci light cavalry screens ottoman center deployment,skirmishes the enemy and draws him into attacking the ottoman centre through harassment and feigned retreats.Infantry and artillery in the centre behind wagon ladder defenses.Irregular Azap infantry on the flanks and janissaries with muskets in the centre,cannons spread over the wagon line.Sipahis on both wings..these will conduct the main mobile battle looking to outflank the enemy and push him inwards infront of the janissaries and cannons where they can be mowed down.Generally a reserve of more sipahis to the rear on each wing.Finally the Sultan with his personal household troops -The kapikulu sipahis and a chosen infantry bodyguard as a last reserve.The use of carts in battle is also called Araba. 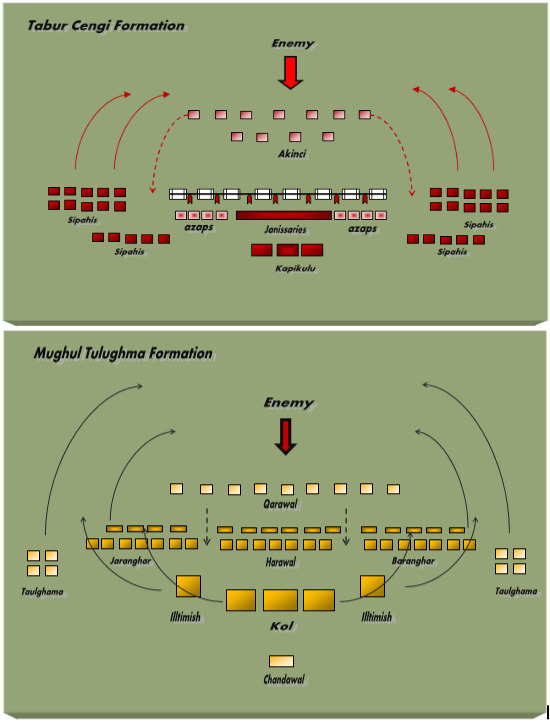 The tulughma implied dividing a smaller force into subordinate divisions within the traditional divisions for better manuverability and flexibility. The highly mobile right and left divisions peeled out and surrounded the larger enemy force,especially through employment of flanking parties.The standard Central Asian battle array, or yasal, was divided into four basic parts—the irawul(Harawal) or vanguard, the ghol(Kol) or center, the chadavul or rear guard, and the jaranghar and baranghar—the left and right flanks. 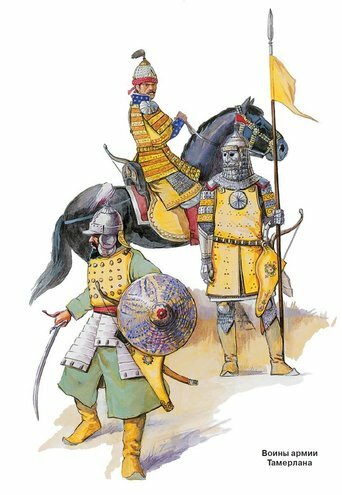 During the early expansion of the Turkic and Mongol empires these units were composed almost exclusively of cavalry, but as these states and their rulers became increasingly sedentary, larger numbers of infantry began to appear. The vanguard was composed primarily of light cavalry and light infantry. It was responsible for scouting and skirmishing.The vanguard acted essentially as a shock absorber for the center, using skirmishing tactics and missile fire to slow and disrupt a frontal assault by enemy heavy cavalry, infantry or elephants. When hard pressed they gradually gave ground and fell back to merge with the main force.Against less aggressive enemies they were tasked with staging harassing attacks followed by feigned retreats designed to lure the opponent into contact with the center and to make them vulnerable to overextension and flanking maneuvers. The center was the largest component and included the commander’s headquarters and bodyguard.It could in conjunction with the vanguard withstand a frontal assault, fixing the enemy in place for envelopment from the flanks. It was also capable of delivering shock action, either as a first strike or on the counterattack. The rear guard was smaller and could act as a reserve but generally protected the baggage. As tactics became more sophisticated particualrly under Timur the larger units were broken down into sub groups which could operate independently.In the picture the standard mughul tulughma formation is shown with qarawal scouts screening,a vanguard ,rightwing and left wing composed of infantry in front and cavalry to the rear. 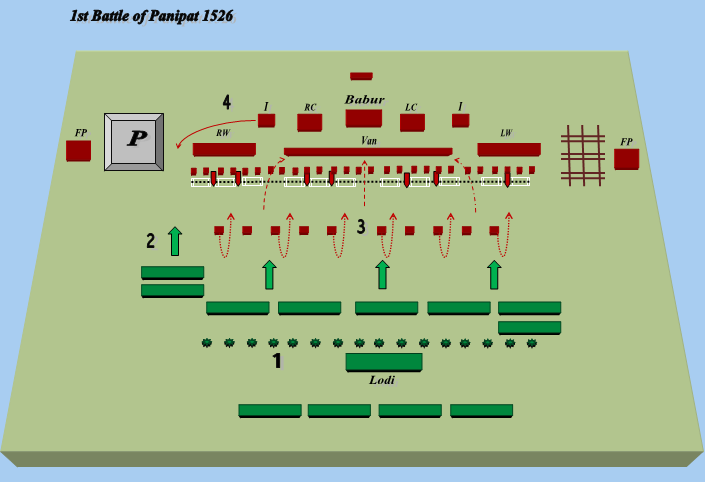 Illtimish Reserves behind each flank.The tulughma flanking parties on the extreme ends.The centre or Kol is divided into 3 divisions -The reserve composing the commander's bodyguard ,The centre right division and the centre left division.Rearguard protects camp.Both the jaranghar and Baranghar wings try to outflank their oppposing flank while the tulughma parties carry out a wide envelopment,centre and vanguard act as a pinning force that can also counterattack frontally.The illtimish reserves behind each flank can reinforce their respective wings or join the flanking movements.Similarly the left centre and right centre can reinforce the wings or take up positions vacated by the wings cavalry while they are carrying out the wheeling movements against the enemy's flanks. 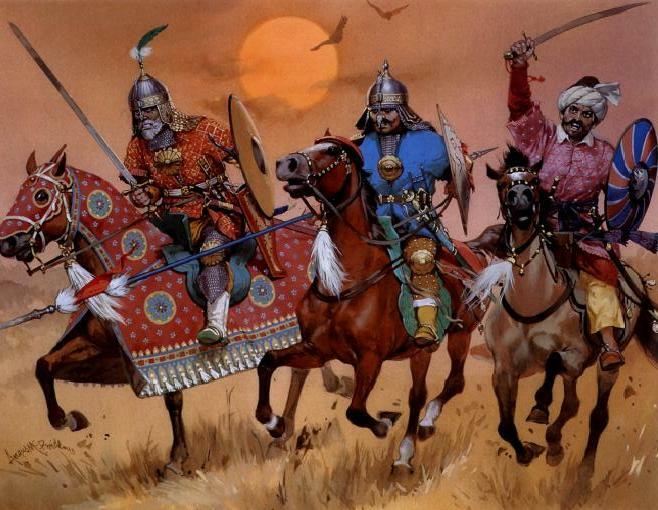 Babur drilled his cavalry regularly to carry out the complex manuevres. The fusion of these 2 similar tactical systems would be employed by Babur at Panipat. Afghans in Green.Mughuls in Red. 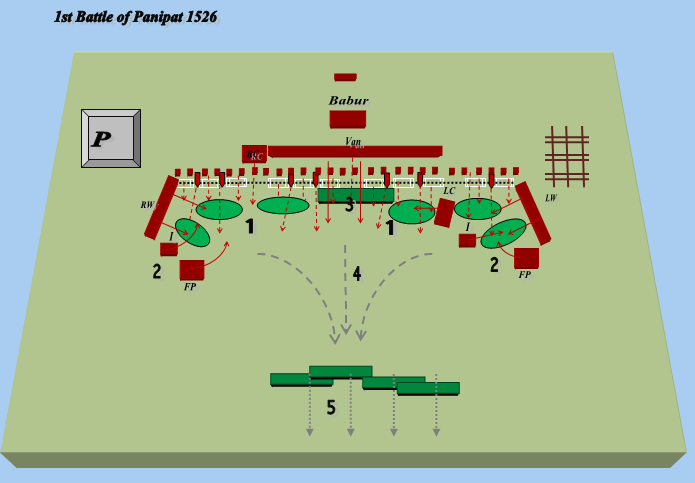 To avoid being outflanked by the large afghan army,Babur anchored his right flank close to the walls of the city of Panipat,while his left flank was protected by a ditch strengthened with a wooden stockade to prevent cavalry movement. In the centre he had a line of 700 ox-carts tied together with rawhide ropes to breakup any charge.At intervals of 100 to 200 yards there were intervals with passages for cavalry to sally out and attack.These passages were heavily defended with archers and matchlockmen and were were possibly closed with chains(chains being lowered when cavalry sallied out).Behind this protective barrier Babur sited his guns.Between every 2 guns,5-6 protective mantlets behind which matchlockmen were deployed. Screening these preparations was the Qarawal light cavalry scouts deployed up front. Behind the infantry and artillery on the cart-line the main body of cavalry was deployed in the standard mughul battle array divided into vanguard,left wing and right wing. (Initials used RW for right wing for eg. ).Plus the centre in 3 sub-divisions and the illtimish reserves. (Illtimish = I ,RC = Right centre,LC = Left Centre).Rearguard protects the camp. At the extreme sides are the tulughma flanking parties (FP).Babur deployed his half-wild Mongol horse archers in these contingents due to their mastery of steppe warfare. Babur's plan is to hold the afghan mass in front,and roll its wings onto the centre where the whole body would become a concentrated target for his matchlocks,archers and artillery and suffer devastating losses.Humayun leads the right flank,Chin Timur the vanguard and Sultan mirza the left flank.His ottoman gunner Ustad Ali Quli is in charge of the atillery.It is also he who shows babur how to employ the cart-line field fortifications. Lodi deploys his force in 4 divisions.Two flanks ,a large vanguard and a centre containing much of the inferior infantry.He places himslef at the very centre of the battle line with a body of 5000 picked mailed lancers.In front of his army stands the massive phalanx of 400 armoured war elephants. 1. 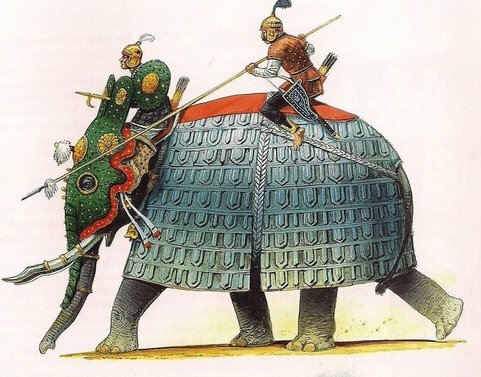 As the afghan War elephants move up,they are greeted by the utterly unfamiliar noise of mughul cannons which terrifies them and they refuse to advance further. 2. The Afghan Vanguard clashes with the horse archer screen and sweeps it away,sensing success- the pathans surge forward.The vanguard of the afghans has advanced too quickly,thus creating a gap with the centre which is still far away . 3. The light cavalry of the former qarawal screen withdraw back through the passages and merge with the mughul vanguard. 4. 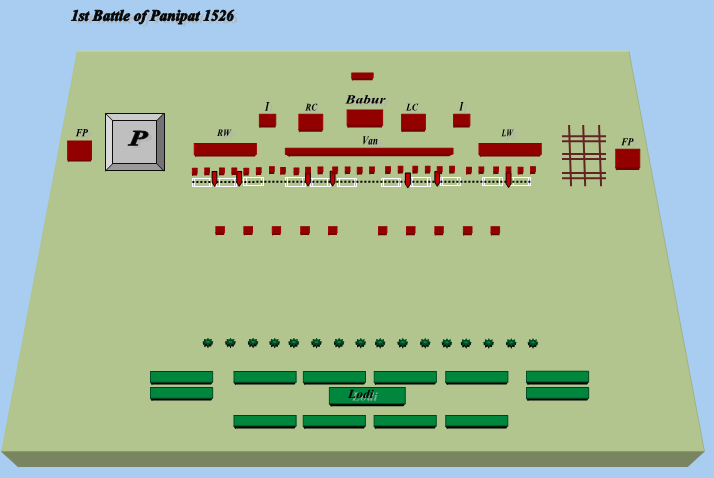 Lodi aims his attack where the mughul right flank meets panipat,and the Afghan right moves forward in columns to try and outflank the mughal right.Babur observes the afghan body inclined to its left advancing on his right flank and immediately reinforces the flank with its illtimish mobile reserve. 1. As the leading elements of the afghan left wing approaches the mughul right,they are taken aback by the wagon line fortifications and hesitate on seeing the mughals reinforcing their right flank.As a result the front ranks halt,throwing the rear ranks already in a cramped space into some disorder.The tulughma flanking parties now wheel and hit them with showers of arrows from the rear. 2. The centre of lodi's vanguard is held up by the concentrated fire from the cart line as the mughul cannons and matchlocks open fire,supported by archers and unable to advance due to the cart line-defenses.The noise and smoke terrifies the afghans. 3. The elephants now under artillery attack and totally unnerved by the sound turn and trample back through the advancing rear ranks of the afghan army, disorganizing and demoralizing it. 4. The mughals begin their celebrated tulughma wheeling manuevre.The right flank reserves move to outflank the Pathan left wing.The afghans now get a taste of the real weapon of the mughals-the deadly turco-mongol composite bow.The afghan heavy cavalry is unable to cope with the mobile timurid horse archers. 5. Babur Piles on the pressure.He dispatches his right centre to join the assault on the afghan left wing. (See how each new reserve takes the place of the preceding formation,as that goes to flank the enemy as if turning a wheel)The afghan left wing is packed into a dense mass,due to the disorder caused by friction between front and rear ranks and becomes a massive target for concentrated mughul firepower from arrows,matchlocks and cannons.They take devastating losses. 6. 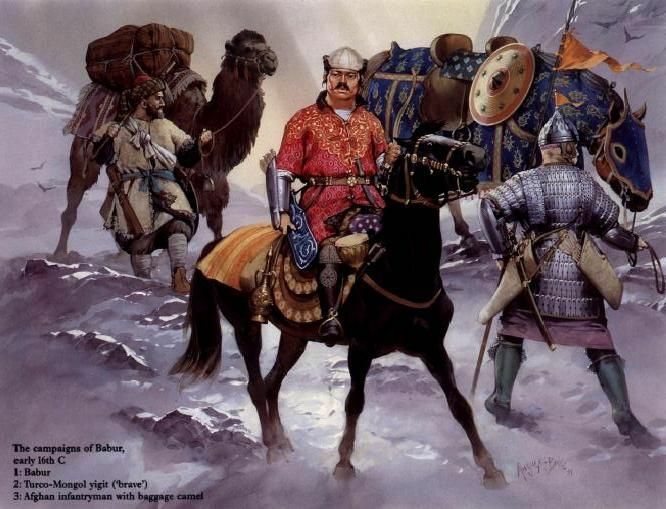 Similarly on the afghan right wing,the mongol flanking parties bombard the pathans from the rear by wheeling in. Simultaneously the mughul left wing moves in and joins the fray,even as the mughal gunpowder weapons take a toll on the front. 7. Babur senses a growing panic in the afghan ranks,and orders his left centre and left mobile reserve to sally out through the gaps and join the assault on the afghan right wing. 1. Bombarded from all sides,unit cohesion breaks down in the sultanate forces- as the aggresively wheeling mughal flanks compress the afghans into a central mass-a perfect killzone for the mughul artillery and gunners. 2. See the mughul taulaghma wheeling manuevre complete on both sides,as the battalions have wheeled almost in synchronization and surrounded the afghan flanks.This exceptional performance was made possible in part by the drilling and combat experience of babur's cavalry. 3. Lodi makes a desperate charge,cutting down quite a few mughals before he is killed.This was perhaps a premature move as he still had many reserves left and babur had nearly none. 4. Lodis' death triggers general collapse and afghans rout. 5. The second line now disintegrate on hearing of lodi's demise. Babur's victory led to the end of the delhi sultanate and the establishment of the Mughul dynasty which was to mark an epoch in the history of medieval india.Babur went on to deal with threats to his position at Khanua against the Rajputs and Gogra against the Afghans,but died before he could consolidate what he had conquered.His son humayun had to deal with a resurgent afghan threat under Sher Shah.The final consolidation of the Mughul Empire was left to Akbar,Babur's grandson.Militarily,the battle of panipat marks the beginning of the gunpowder age in earnest and the end of the age of elephants as the prime weapon of indian warfare. 1. Intelligence - The difference in effiecient intelligence had been apparent.Babur's espionage system allowed him to intercept reinforcements from hamid khan to lodi.While babur continously probed the afghans during the standoff,ibrahim lodi had not sufficiently prepared for the true nature of the Moghul defences and was surprised.His intelligence on babur's army too seems to have been minimal as he gave no thought to effect of cannons on elephants and made them a cornerstone of his tactics. 2. Discipline - Babur's army was by far more disciplined,being able to execute the complex wheeling manuevre flawlessly,while the afghans were thrown into disorder by their own follies and also charged prematurely ahead of the centre. 3. Morale - Morale seems to have been high in babur's camp.Babur treated his soldiers with an air of equality and the mughals were in enemy territory with nowehere to run.Ibrahim Lodis' troops on the other hand ,at least a part of them were discontent and the vanity of lodi himself didn't help matters.The elephant havoc and lodi's death were the last straw. 4. Technology -Babur's forces had the next generation of weapons technology available in form of cannons and matchlocks.While these were still primitive in form they rendered the elphants useless and gave babur an edge. 5. 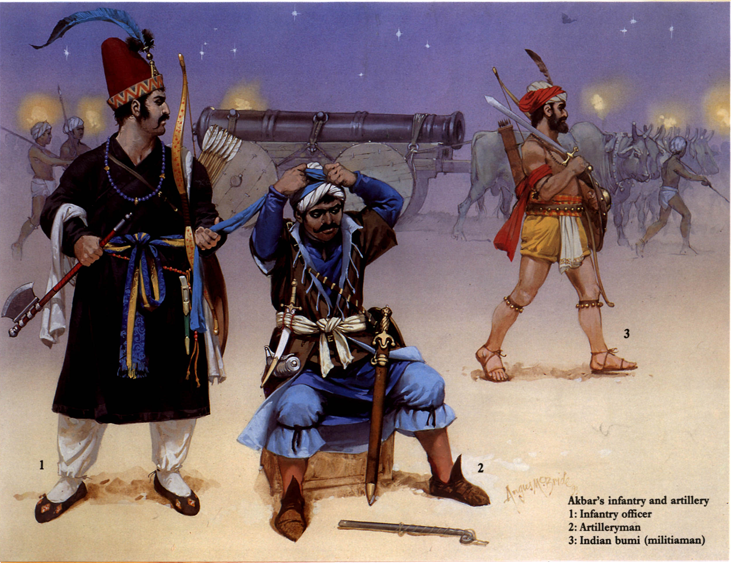 Firepower Dominance -While the afghans placed their faith on shock tactics,the mughals enjoyed a total dominance throughout the battle in firepower.The artillery,matchlocks but above all. 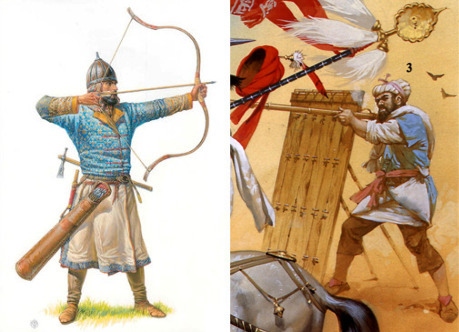 the turko-mongol composite bow shattered afghan ranks with a ceaseless barrage.Firepower's effect is not only physical,but also psychological-as there is nothing worse to a soldier than to be fired at without being able to reply. 6. Surprise - Babur's unorthodox tactics.The use of the cart line and the artillery placement and the Tulughma flanking attacks,befuddled the afghans.These were things not seen before in the subcontinent's battlefields. 7. Failure of Elephants - The reverse rout of the elephants trampling through their own ranks,totally ruined afghan rear ranks cohesion and was a major reason why they never participated in the battle.But the elephant was a weapon of a bygone age. 8. Ibrahim's Death - Lodis' charge was premature and unnecessary,while things were desperate upfront,he still had his centre division-shaken and albeit disorganized ,but intact.He would have better served to rally his reserve and assault the flanking mughal columns.If he had lived another hour,the mughals may have lost the battle as babur had minimal reserves left and the mughals too had suffered heavy causalities. 9. Security - To Napoleon is credited the saying - ''The whole art of war consists of a well-thought out and extremely circumspect defensive,followed by a rapid and audacious counterattack''.Babur's tactics at Panipat were a perfect balance between caution and aggression.He secured his flanks with natural or artificial obstacles and his centre with this cart-line offsetting the afghan advanatge in numbers. Levina and Inactive like this.